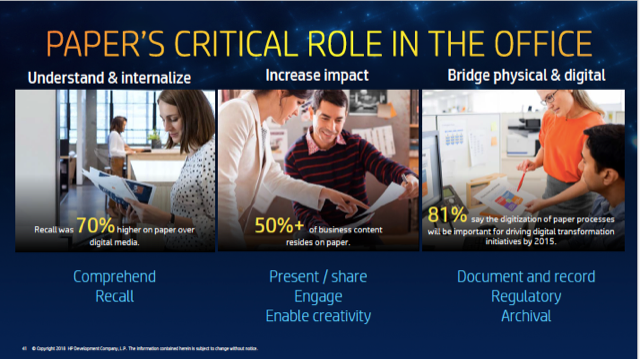 HP Power of Print Analyst Event in Palo Alto / PART 2 – Flexibility and productivity to inspire innovation | Document Advisors | IDeAs blog, for better document strategies. HP is not resting on its laurels, and laid out its plans to continue growth. They are on track to achieve their stated goal of 12% market share in A3 by 2020, to add to their ongoing dominance of A4, where they have nearly 50% market share. They also continue to grow in the professional print and graphics sector, driving the switch from analogue to digital printing. Even in home printing, perhaps the toughest sector, HP is achieving growth, with impressive adoption rates for Instant Ink, and through ongoing innovation, appealing to the changing print behaviour of millennials and Generation Z. For a long time, it was thought by many in the industry that the emergence of new generations who had grown up with digital devices, and were used to viewing documents on screens, would lead to a structural decline in print volumes. However, this doesn’t seem to be happening; millennials don’t print less, they just print differently. This ties in with another important shift, towards more flexible working, which is blurring the boundary between office and home printing. HP cited the rapid growth of flexible office space provider WeWork, as an example of the new type of work environment, and the need for print solutions which can be used both in this type of office environment, and when working at home. A key element here is having the ability to print easily from any device to any printer in any location, without the need to load drivers. With the Roam for Business mobile printing solution, HP appears finally to have come up with a solution to this conundrum. Another important aspect of the new style of printing is to help manage work-flows with apps and solutions which can be managed from smart phones. The Samsung print acquisition has given HP access to Samsung’s expertise with the Android platform, enabling development of the new Jet Advantage Apps programme. The idea here is to integrate paper and digital work-flows, combining the speed of digital with the convenience of paper, to improve user productivity and reduce cost. Basing this on the widely-used Android platform opens up and simplifies development, to allow the creation of a big App catalogue. For resellers, this provides a delivery platform, with remote installation, configuration and management, and Cloud-based services, to add security and improve user productivity. Productivity is also a key issue for resellers in delivery of product services, as they look to reduce costs in order to remain competitive. With Smart Device Services, HP has taken remote diagnostics and management of printers to a new level, combining machine learning and AI, and integrating with most of the industry-leading fleet management software platforms. This is now delivering impressive cost reductions, of 11% in service labour, and 6% in parts and supplies. However, a key issue here will be how to turn savings on labour into real value for channel partners, especially those who are multi-brand and have mixed fleets, making it difficult for them to reduce the number of service technicians. Another way to look at this would be to redeploy the resource freed up, to support more value-added services, such as workflow apps, but also to enable channel partners to extend their offering, for example into IT Services. This article was written on 15 Nov 2018, and is filled under Event, Point of View.